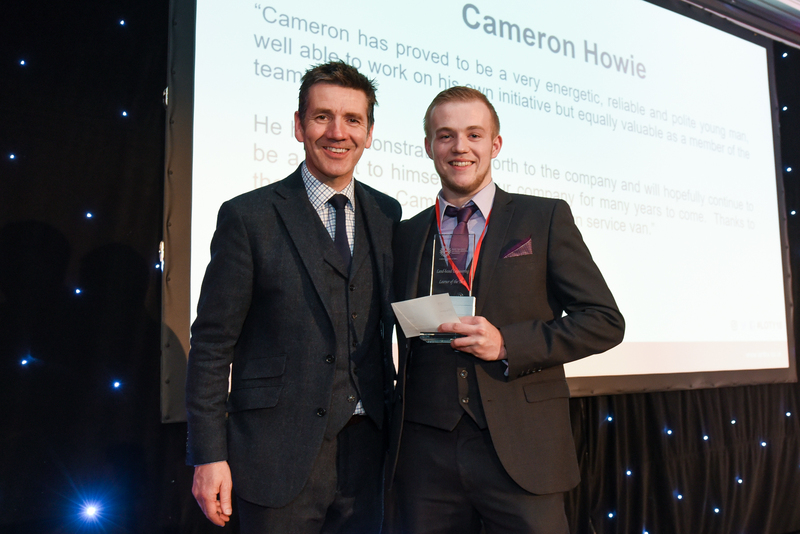 Cameron Howie, a student at Barony studying his Modern Apprenticeship in Land-based Engineering, and working for John H McNae Ltd has won the Engineering Learner of the Year at the prestigious LANTRA Awards. Trainees and apprentices from across the country gathered at the DoubleTree by Hilton Dunblane Hydro along with friends, families, employers, training providers and industry leaders to take part n the 16th Learner of the Year awards. A previous overall learner of the year winner,Emma Staniforth, spoke about her experiences as one of Lantra’s industry champions. The keynote speech was given by Dougie Vipond, TV presenter of sports and outdoors programmes and Deacon Blue founder member and drummer. Dougie then presented winners and runners-up awards for all the categories. Eight other SRUC students also attended the final and received recognition for their achievements.